Ektar is a simple folk instrument. It is used to provide both a drone as well as simple rhythmic accompaniment to folk songs or yoga kirtan. It may be the oldest stringed instrument in the Indian subcontinent. The ektar is described in ancient Sanskrit texts as the ekatantri vina, literally the "one stringed lute". My Ektars are made from locally growm materials, giant gourd, black bamboo, maple laminate, shell or brass for the bridge. This product is pick up only because of the size and delicate nature of the instrument. 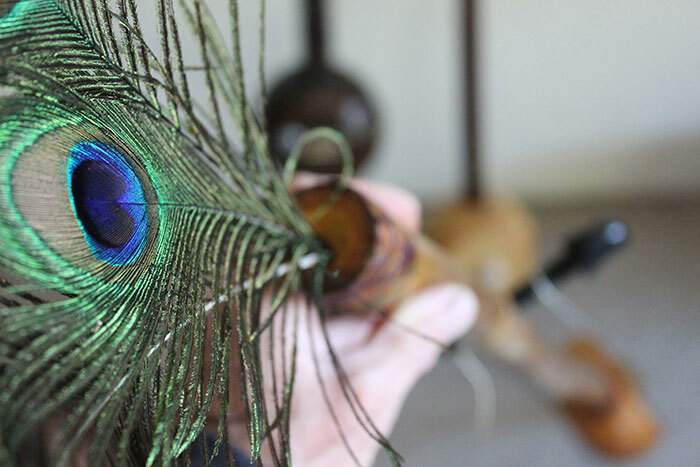 With it's decorative peacock feathers and the natural design on the gourd surface, these simple folk instruments sound great, look great and are also pretty easy to play and tune. Personally, my favourite instrument for yoga kirtan. These are bespoke instruments made in Manly NSW, variations such as a pickup, with or without feathers can't be made to order. All instruments are available from my workshop in Manly through appointment. Not only do they have a great sound, but they look very ascetic hanging on the wall. Pickup only as the instrument is too long and delicate to ship.